Christianity may not have been the first Mediterranean religion to find its way to Ireland. 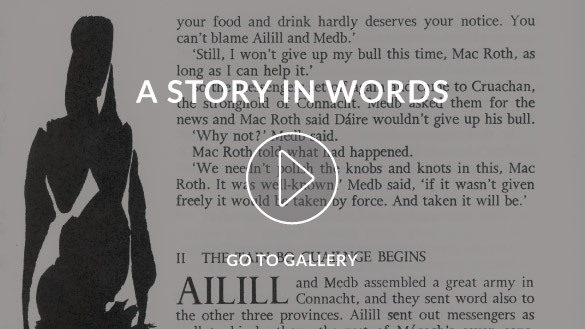 The most famous Irish legend, the Táin Bó Cuailgne, centres on the struggle for control of a magical bull. It thus suggests distant echoes of the presence in Bronze Age Ireland of a bull cult that itself originated millennia before in the eastern Aegean Sea. Versions of this cult spread into the Iberian peninsula, and it would not be surprising if it resonated with Ireland’s cattle-rearing society. 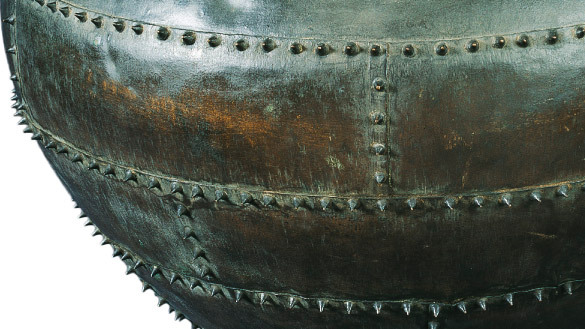 This magnificent bronze cauldron, found in a bog in Castlederg, Co. Tyrone, is crafted from offset bands of sheet bronze held in place by rows of conical rivets. It could be seen simply as an expression of a chieftain’s bounty in feasting his followers, but it almost certainly had a ritual as well as a social significance. The skills of casting, beating and riveting required to make it, and the care with which similar cauldrons were repaired from time to time, suggest it was a valuable object and one of very special status. It was probably used as a central part of elite ceremonies in which the local king’s ability to share food and drink was an enactment of his power. Cauldrons like this one are at the root of the folk tales of ‘cauldrons of plenty’ that survived for millennia in Europe. But that plenty depended on the reign of the ‘proper’ king. 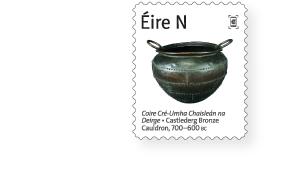 Eamonn Kelly of the National Museum speculates that the cauldron may have been associated with a ritual for the choice of a new king, in which a bull was sacrificed. In his view, the cauldron is best understood in association with two other kinds of objects from the same period that also feature in the huge hoard found at Dowris, Co. Offaly: bronze horns that, when blown, produce ‘a deep bass note, resembling the bellowing of a bull’; and so-called crotals, pear-shaped bronze objects that look like hand grenades but were perhaps meant to represent the bull’s scrotum. We cannot know for sure whether the cauldron was indeed part of a coherent bull cult, but it is reasonable to see such cauldrons as aristocratic possessions that were put to periodic use. Moreover, the fact that so many have been recovered as single deposits in bogs may indicate a special ceremonial significance. What is clear is that the practice of using bronze feasting equipment belongs to a widespread central and western European Bronze Age elite fashion. The distribution of such prestigious items as cauldrons, and of swords, shields, personal ornaments and a range of other metal artefacts, shows strong interaction between the aristocratic elements of various European communities, and how elite fashions travelled among them. These are only the most visible expression of inter-relationships that must also have included the movement of less durable items. This Later Bronze Age ferment of activity and the frequent contacts it implies may well be one of the elements in the evolution of a common ‘Celtic’ language. And for all of these elites, the cauldron expressed the double nature of kingship. It unites ritual power with the most basic fact of life: the need to eat. A ruler who cannot guarantee the one has no right to claim the other.